Browning Haus German Shepherd Kennel is a professional German Shepherd Breeder located in Gaylord Michigan. Dale and I have been breeding German Shepherds since 1984. We are very serious personal breeders, All our dogs and puppies are raised in our home, All our puppies are always given one on one attention. Puppies are kept in a very clean and structured area. Each puppy is held and is instructed on sitting, stay and simple puppy commands starting at age 5 weeks. All of our puppies are micro chipped, each puppy is always Veterinarian checked and giving the appropriate shots for his or her age. We breed our puppies for home protection and companionship our dogs are show quality and all of my puppies are sold with unlimited registration. Our German Shepherd dogs have West German working lines and East German DDR Lines. 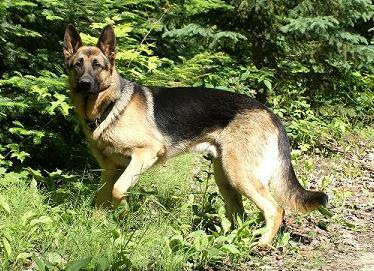 The East German Shepherds / DDR German Shepherds are known for their large bones, big blocky head, sound temperment and dark pigmentation. These DDR Dogs are also know for excellent health and low incidents of hip dysplasia. With proper training these East German Shepherds are capable of doing Schutzhund, search and rescue, police K-9 and personal protection. Our goals for breeding are to produce German Shepherd dogs with outstanding working ability, proper structure and most important a sound Temperment. Some of our German Shepherds are placed in working homes, most go to families with children. These German Shepherds are excellent, loyal companions.